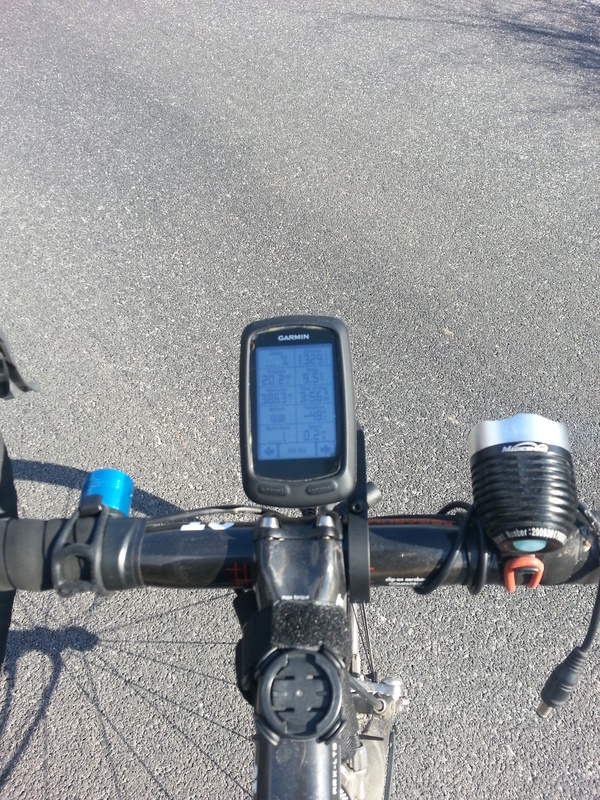 This post is to address the issue of charging your Garmin Edge on the move. It’s been an ongoing problem for the long distance cyclist since the days of the 305. Battery life for an 800 is about 12 hours from 100% charge. 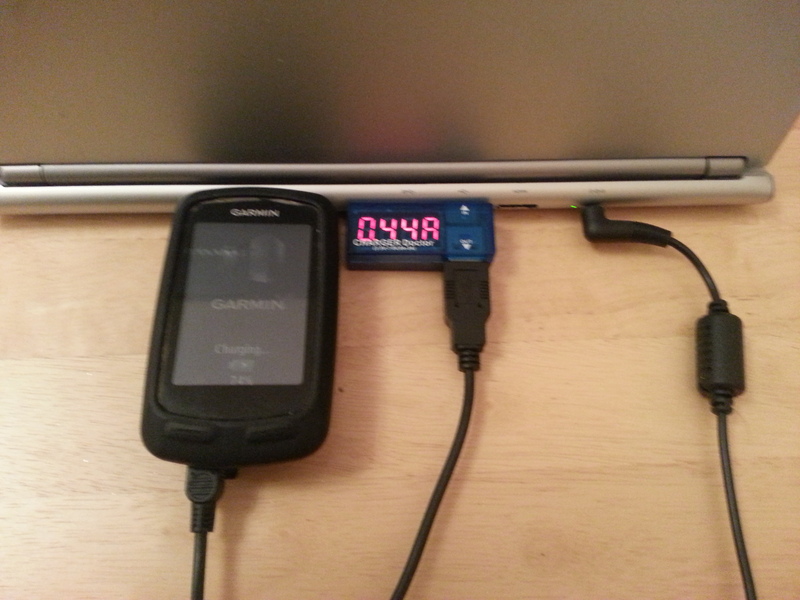 I resorted to trying to charge up my 305 in Audax control points with mixed results. As you can see an Edge 800 draws 440mA whilst charging a 50% discharged edge. You can’t get blood out of a stone and whatever system you use your biggest enemy is going to be time. So for an Edge 800 it has to be the stem mount, conversely for an Edge 705 a bar mount may be the better option. On a 705 the charging port is on the bottom and an oversize stem may interfere with USB plug. Do an Ebay or Amazon search for Power Bank or Power Monkey. There is a vast choice. £70 is too much imho, bear in mind it has to charge on the move and the battery needs mounting somewhere. It needs to be robust. Your Edge shutting down 100 miles is not something you want to see on a 120 mile ride. The cheap emergency phone chargers are not up to the job for todays devices, like I said you cannot get blood out of a stone. They are designed for a Nokia and who uses them these days. The same applies to smartphones perhaps to a greater degree as battery life is hopeless with all the bells and whistles on. In the near future I will be making a charging regulator designed to make use of the MagicShine battery pack. The pack is rated at 8800mA/hr and will power the light for 3.5 hours. It will consist of a 7805 regulator and plug for the battery. Hi, maybe I’m missing something here. I didn’t think you could use the Garmin Edge while it was charging? Hi Kev, there is a difference between charging from a USB port on a computer and a charger. When plugged into a Laptop the Garmin switches into file transfer mode. I’ve just tried it to make sure I wasn’t talking rubbish. Valid point I will add it to the post. It’s also dependant on the cable, Frank. Some USB cables are for charging only and will not go into data transfer mode even if you connect it to a PC/laptop, as the data pins are shorted. For things like mobile phones and tablets, these cables will affect the amount of current the device can pull, and therefore how quickly they charge. By pure coincidence, I’ve been working on a post about this topic too, but you beat me to the publish button! Hi Alan I built a charger a few years back, It was for a 705 and had interference issues with the stem. I’ve requested a Strava Widget from WordPress but the silence is deafening. I have to replace an S3 socket so I know about the data pins. Good to see you’re still out and about Frank. Thanks Stan, nowhere near the level I was at when I did your rides, I,m trying to get out to your neck of the woods as I need to get some Welsh hills under my belt again. Sunday rides have all but gone due to lifetime events like grandkids. I use a teck net 7000 mAh powerbank (amazon) for audax rides pop it in a saddlebag or bar bag,an extra 250g but it works well.